"Department of Veterans Affairs" redirects here. For other uses, see Veterans Affairs. "To care for him who shall have borne the battle and for his widow, and his orphan." The United States Department of Veterans Affairs (VA) is a federal Cabinet-level agency that provides near-comprehensive healthcare services to eligible military veterans at VA medical centers and outpatient clinics located throughout the country; several non-healthcare benefits including disability compensation, vocational rehabilitation, education assistance, home loans, and life insurance; and provides burial and memorial benefits to eligible veterans and family members at 135 national cemeteries. While veterans benefits have been provided since the American Revolutionary War, an exclusively veteran-focused federal agency, the Veterans Administration, was not established until 1930, and became the cabinet-level Department of Veterans Affairs in 1989. The VA employs 377,805 people at hundreds of Veterans Affairs medical facilities, clinics, benefits offices, and cemeteries. In Fiscal Year 2016 (1 Oct 2015 – 30 Sep 2016), net program costs for the department were $273 billion, which includes VBA Actuarial Cost of $106.5 billion for compensation benefits. The long-term actuarial accrued liability (total estimated future payments for veterans and their family members) is $2.491 trillion for compensation benefits; $59.6 billion for education benefits; and $4.6 billion for burial benefits. The agency is led by the Secretary of Veterans Affairs, who—being a cabinet member—is appointed by the President with the advice and consent of the Senate. In May 2014, it was revealed that veterans died while waiting for their appointments during extended delays in getting care at the Veterans Health Administration. An investigation found that VA personnel falsified scheduling data to make it seem as if they had met scheduling targets. The Continental Congress of 1776 encouraged enlistments during the American Revolutionary War by providing pensions for soldiers who were disabled. Direct medical and hospital care given to veterans in the early days of the U.S. was provided by the individual states and communities. In 1811, the first domiciliary and medical facility for veterans was authorized by the federal government, but not opened until 1834. In the 19th century, the nation's veterans assistance program was expanded to include benefits and pensions not only for veterans, but also their widows and dependents. After the end of the American Civil War in 1865, many state veterans' homes were established. Since domiciliary care was available at all state veterans homes, incidental medical and hospital treatment was provided for all injuries and diseases, whether or not of service origin. Indigent and disabled veterans of the Civil War, Indian Wars, Spanish–American War, and Mexican Border period as well as discharged regular members of the Armed Forces were cared for at these homes. Congress established a new system of veterans benefits when the United States entered World War I in 1917. Included were programs for disability compensation, insurance for service persons and veterans, and vocational rehabilitation for the disabled. By the 1920s, the various benefits were administered by three different federal agencies: the Veterans Bureau, the Bureau of Pensions of the Interior Department, and the National Home for Disabled Volunteer Soldiers. The establishment of the Veterans Administration came in 1930 when Congress authorized the president to "consolidate and coordinate Government activities affecting war veterans". The three component agencies became bureaus within the Veterans Administration. Brigadier General Frank T. Hines, who directed the Veterans Bureau for seven years, was named as the first Administrator of Veterans Affairs, a job he held until 1945. The close of World War II resulted in not only a vast increase in the veteran population, but also a large number of new benefits enacted by Congress for veterans of the war. In addition, during the late 1940s, the VA had to contend with aging World War I veterans. During that time, "the clientele of the VA increased almost five fold with an addition of nearly 16,000,000 World War II veterans and approximately 4,000,000 World War I veterans". Prior to World War II, in response to scandals at the Veterans Bureau, programs that cared for veterans were centralized in Washington, D.C. This centralization caused delays and bottlenecks as the agency tried to serve the World War II veterans. As a result, the VA went through a decentralization process, giving more authority to the field offices. The World War II GI Bill was signed into law on 22 June 1944, by President Franklin D. Roosevelt. "The United States government began serious consolidated services to veterans in 1930. The GI Bill of Rights, which was passed in 1944, had more effect on the American way of life than any other legislation - with the possible exception of the Homestead Act." The VA health care system has grown from 54 hospitals in 1930 to include 153 medical centers; more than 700 outpatient, community, and outreach clinics; 126 nursing home care units; and 35 domiciliaries. VA health care facilities provide a broad spectrum of medical, surgical, and rehabilitative care. The responsibilities and benefits programs of the Veterans Administration grew enormously during the following six decades. Further educational assistance acts were passed for the benefit of veterans of the Korean War, the Vietnam Era, the introduction of an "all-volunteer force" in the 1970s (following the end of conscription in the United States in 1973), the Persian Gulf War, and those who served following the attacks of September 11, 2001. The Department of Veterans Affairs Act of 1988 (Pub.L. 100–527) changed the former Veterans Administration, an independent government agency established in 1930, primarily to see to the needs of World War I veterans, into a Cabinet-level Department of Veterans Affairs. It was signed into law by President Ronald Reagan on 25 October 1988, but actually came into effect under the term of his successor, George H. W. Bush, on 15 March 1989. The Department of Veterans Affairs was created due to nearly one third of the population being eligible for veterans benefits. Its proponents argued that due to the large number of Americans affected by the VA, it needed an administrator who had direct access to the president. In their major reform period of 1995–2000, the Veterans Health Administration (VHA) implemented universal primary care, closed 55% of their acute care hospital beds, increased patients treated by 24%, had a 48% increase in ambulatory care visits, and decreased staffing by 12%. By 2000, the VHA had 10,000 fewer employees than in 1995 and a 104% increase in patients treated since 1995, and had managed to maintain the same cost per patient-day, while all other facilities' costs had risen over 30% to 40% during the same period. In May 2014, critics of the VA system reported major problems with scheduling timely access to medical care. As of May 2014, one retired doctor said that at least 40 United States Armed Forces veterans died because of delays getting care at the Phoenix, Arizona Veterans Health Administration facilities. An investigation of delays in treatment throughout the Veterans Health Administration system was conducted by the Veterans Affairs Inspector General, who found that 3 veterans, not 40, had died while waiting for care at Phoenix, and found no evidence that they had died because of the delay. However, VA personnel did alter scheduling data to make it seem as if they had met the scheduling targets. On 30 May 2014, Secretary of Veterans Affairs Eric Shinseki resigned from office due to the fallout from the scandal, saying he could not explain the lack of integrity among some leaders in VA healthcare facilities. "That breach of integrity is irresponsible, it is indefensible, and unacceptable to me. I said when this situation began weeks to months ago that I thought the problem was limited and isolated because I believed that. I no longer believe it. It is systemic. I was too trusting of some and I accepted as accurate reports that I now know to have been misleading with regard to patient wait-times," Shinseki said in a statement. He said he could not defend what happened because it was indefensible, but he could take responsibility for it and he would. In response, on 27 April 2017 President Trump signed an executive order creating an Office of Accountability and Whistleblower Protection. Afterwards, in September 2017, the VA declared its intent to abolish a 1960s conflict of interest rule prohibiting employees from owning any stock, performing any service, or doing any work at for-profit colleges; arguing that, for example, the 1960s rule prohibits VA doctors from teaching veterans at for-profit universities with special advantages for veterans. On September 26, 2018, Sec. Wilkie testified to Congress that the agency was still using a 50-year-old computer to process benefits. The VA's primary function is to support veterans in their time after service by providing benefits and support. A current initiative in the Department is to prevent and end veterans' homelessness. The VA works with the United States Interagency Council on Homelessness to address these issues. The USICH identified ending veterans' homelessness by 2015 as a primary goal in its proposal Opening Doors: Federal Strategic Plan to Prevent and End Homelessness, released in 2010; amendments to the 2010 version made in 2015 include a preface written by U.S. Secretary of Labor Thomas E. Perez that cites a 33% reduction in veteran homelessness since the creation of the Opening Doors initiative. The Department of Veterans Affairs is headed by the Secretary of Veterans Affairs, appointed by the President with the advice and consent of the Senate. The Secretary of Veterans Affairs is Robert Wilkie who was selected by President Donald Trump and sworn in by Vice President Mike Pence on 30 July 2018. 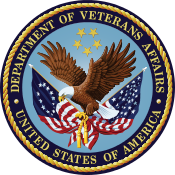 The Deputy Secretary of Veterans Affairs position is currently vacant with the retirement of Thomas G. Bowman on 15 June 2018. The third listed executive on the VA's official web site is its Chief of Staff (currently Vivieca Wright Simpson); the Chief of Staff position does not require Senate confirmation. In addition to Secretary and Deputy Secretary, the VA has nine more positions requiring presidential appointment and Senate approval. There are Assistant Secretaries of Veteran Affairs for: Congressional and Legislative Affairs; Policy and Planning; Human Resources and Administration; and Operations, Security and Preparedness. Other Senate-approved presidential nominees at the VA include: Chief Financial Officer; Chairman of the Board of Veterans' Appeals; General Counsel; and Inspector General. For VA benefits for PTSD, see Veterans benefits for post-traumatic stress disorder in the United States. The VA, through its Veterans Benefits Administration (VBA), provides a variety of services for veterans including disability compensation, pension, education, home loans, life insurance, vocational, rehabilitation, survivors’ benefits, health care, and burial benefits. The Department of Labor (DOL) provides job development and job training opportunities for disabled and other veterans through contacts with employers and local agencies. As is common in any time of war, recently there has been an increased demand for nursing home beds, injury rehabilitation, and mental health care. The VA categorizes veterans into eight priority groups and several additional subgroups, based on factors such as service-connected disabilities, and their income and assets (adjusted to local cost of living). Reservists and National Guard personnel who served stateside in peacetime settings or have no service-related disabilities generally do not qualify for VA health benefits. The VA's budget has been pushed to the limit in recent years by the War on Terrorism. In December 2004, it was widely reported that VA’s funding crisis had become so severe that it could no longer provide disability ratings to veterans in a timely fashion. This is a problem because until veterans are fully transitioned from the active-duty TRICARE healthcare system to VA, they are on their own with regard to many healthcare costs. The VA's backlog of pending disability claims under review (a process known as "adjudication") peaked at 421,000 in 2001, and bottomed out at 254,000 in 2003, but crept back up to 340,000 in 2005. No copayment is required for VA services for veterans with military-related medical conditions. VA-recognized service-connected disabilities include problems that started or were aggravated due to military service. Veteran service organizations such as the American Legion, Veterans of Foreign Wars, and Disabled American Veterans, as well as state-operated Veterans Affairs offices and County Veteran Service Officers (CVSO), have been known to assist veterans in the process of getting care from the VA. In his budget proposal for fiscal year 2009, President George W. Bush requested $38.7 billion—or 86.5% of the total Veterans Affairs budget—for veteran medical care alone. In the 2011 Costs of War report from Brown University, researchers projected that the cost of caring for veterans of the War on Terror would peak 30–40 years after the end of combat operations. They also predicted that medical and disability costs would ultimately total between $600 billion and $1 trillion for the hundreds of thousands treated by the Department of Veterans Affairs. The new GI Bill authored by Sen. Jim Webb (D-VA) doubled GI Bill college benefits while providing a 13-week extension to federal unemployment benefits. The new GI Bill more than doubled the value of the benefit to roughly $90,000 up from $40,000. In-state public universities essentially are covered to provide full scholarships for veterans under the new education package. For those veterans who served at least three years a monthly housing stipend was also added to the law. Upon passage of the new GI Bill President George W. Bush stated "Our nation has no greater responsibility than to support our men and women in uniform—especially because we're at war... This bill shows the American people that even in an election year, Republicans and Democrats can come together to support our troops and their families", which highlighted that the new GI Bill had been overwhelmingly supported by both parties in the U.S. Congress. Congress and President Barack Obama extended the new GI Bill in August 2009 at the cost of roughly $70 billion over the next decade. The Department of Defense (DoD) allows individuals who, on or after 1 August 2009, have served at least 6 years in the Armed Forces and who agree to serve at least another 4 years in the U.S. Armed Forces to transfer unused entitlement to their surviving spouse. Servicemembers reaching 10 year anniversaries could choose to transfer the benefit to any dependent(s) (spouse, children). In 1973, the Veterans Administration assumed another major responsibility when the National Cemetery System (NCS) (except for Arlington National Cemetery) was transferred to the Veterans Administration from the Department of the Army. In 1978, Congress established the State Cemetery Grants Program (Public Law 95-476). This act is administered by the National Cemetery Administration to aid States and U.S. territories in the establishment, expansion and improvement of veterans cemeteries. The VA was charged with the operation of the NCS, including the marking of graves of all persons in national and State cemeteries (and the graves of veterans in private cemeteries, upon request) as well and administering the State Cemetery Grants Program. The VA's National Cemetery Administration maintains 131 national cemeteries in 39 states (and Puerto Rico) as well as 33 soldier's lots and monument sites. The Department of the Army maintains two national cemeteries, the Arlington National Cemetery and the U.S. Soldiers' & Airmen's Home National Cemetery. Many states have established state veterans cemeteries. The American Battle Monuments Commission maintains 25 overseas military cemeteries that serve as resting places for almost 125,000 American war dead; on Tablets of the Missing that memorialize more than 94,000 U.S. servicemen and women; and through 25 memorials, monuments and markers. Fourteen national cemeteries are maintained by the National Park Service. In the latest Center for Effective Government analysis of 15 federal agencies which receive the most Freedom of Information Act (United States) (FOIA) requests, published in 2015 (using 2012 and 2013 data, the most recent years available), the VA earned a D by scoring 64 out of a possible 100 points, i.e. did not earn a satisfactory overall grade. The VA employs 377,805 people, of which 338,205 are nonseasonal full-time employees. The American Federation of Government Employees represents 230,000 VA employees, with VA matters addressed in detail by the National VA Council. ^ "FedScope - Federal Human Resources Data" (IBM Cognos PowerPlay Studio). Office of Personnel Management (data cube). March 2017. Cube path: storeID("iADB7BB71D42D4272B4C2DAB1A37A986F") - Data source connection: Employment - March 2017. Retrieved 13 Jun 2017. ^ "2016 VA Agency Financial Report, Section II - Financial Statements, Net Program Costs By Administration Before Changes In Veterans Benefits Actuarial Liability Assumptions" (PDF). Department of Veterans Affairs. 15 Nov 2016. p. 36. Retrieved 12 Jun 2017. VA expends a substantial amount of its budgetary resources on medical care for Veterans and also disburses large cash amounts for Veteran’s compensation and education benefits programs. ^ "2016 VA Agency Financial Report, Section I – Analysis of Entity's Financial Statements and Stewardship Information, Net Cost of Operations, Chart 5: FY 2016 Program Costs (Gross)" (PDF). Department of Veterans Affairs. 15 Nov 2016. p. 30. Retrieved 12 Jun 2017. ^ "2016 Financial Report of the United States Government, Notes to the Financial Statements, Note 12. Federal Employee and Veteran Benefits Payable" (PDF). Bureau of the Fiscal Service, U.S. Department of the Treasury. 12 Jan 2017. pp. 101–109. Retrieved 13 Jun 2017. The Government compensates disabled veterans and their survivors. Veterans' compensation is payable as a disability benefit or a survivor’s benefit. Entitlement to compensation depends on the veteran’s disabilities having been incurred in, or aggravated during, active military service; death while on duty; or death resulting from service-connected disabilities, if not on active duty. ¶ Eligible veterans who die or are disabled from military service-related causes, as well as their dependents, receive compensation benefits. Also, veterans are provided with burial flags, headstones/markers, and grave liners for burial in a VA national cemetery or are provided a burial flag, headstone/marker and a plot allowance for burial in a private cemetery. These benefits are provided under 38 U.S.C., Part 2, Chapter 23 in recognition of a veteran’s military service and are recorded as a liability in the period the requirements are met. ¶ The liability for veterans’ compensation and burial benefits payable is based on an actuarial estimate of future compensation and burial payments and increased by $477.7 billion in fiscal year 2016. The $477.7 billion increase is primarily attributable to assumption changes and experience. The major actuarial assumption changes and experience impacts include growth in compensation counts, new mortality rates, changes in the discount rate, and an increase in beneficiary counts. ¶ Several significant actuarial assumptions were used in the valuation of compensation and burial benefits to calculate the present value of the liability. A liability was recognized for the projected benefit payments to: 1) those beneficiaries, including veterans and survivors, currently receiving benefit payments; 2) current veterans who will in the future become beneficiaries of the compensation program; and 3) a proportional share of those in active military service as of the valuation date who will become veterans in the future. Future benefit payments to survivors of those veterans in classes 1, 2, and 3 above are also incorporated into the projection. The projected liability does not include any administrative costs. ¶ The veterans' compensation and burial benefits liability is developed on an actuarial basis. It is impacted by interest on the liability balance, experience gains or losses, changes in actuarial assumptions, prior service costs, and amounts paid for costs included in the liability balance. ^ U.S. Const. art. II, § 2, cl. 2. ^ Department of Veterans Affairs Act § 18(b), 38 USC § 301 (2017). ^ Kammerer, Gladys 1948. "The Veterans Administration in Transition". Public Administration Review Vol. 8, No. 2, pp 104. ^ "Total Served in World War II for USA" (PDF). ^ "WWII Veteran Statistics". The National WWII Museum | New Orleans. Retrieved 2019-03-12. ^ Kammerer, Gladys 1948. "The Veterans Administration in Transition". Public Administration Review Vol. 8, No. 2, pp. 103–109. ^ "Welcome to". Ourdocuments.gov. Retrieved 2014-08-01. ^ U.S. Senior Vets. "U.S. Senior Vets, Serving Those Who Sacrificed, Veterans Aid and Attendance". Usseniorvets.com. Retrieved 2014-08-01. ^ "VA History In Brief" (PDF). Retrieved 30 December 2016. ^ Scott Bronstein and Drew Griffin. "A fatal wait: Veterans languish and die on a VA hospital's secret list". CNN. Retrieved 31 May 2014. ^ "Obama vows action on any VA 'misconduct'". BBC News. Retrieved 31 May 2014. ^ "Veterans Secretary Eric Shinseki resigns after report". BBC News. Retrieved 31 May 2014. ^ "US president accepts with 'regret' Veterans Affairs chief's resignation". Chicago Chronicle. Retrieved 31 May 2014. ^ "Improving Accountability and Whistleblower Protection at the Department of Veterans Affairs". Federal Register. 2017-05-02. Retrieved 2017-11-18. ^ C-SPAN. 2018/9/26. C-SPAN3. https://www.c-span.org/video/?451762-1/va-secretary-wilkie-testifies-agency-priorities. Senate Oversight Hearing. Veterans Affairs Secretary Robert Wilkie testifies before the Senate Veterans' Affairs Committee on the agency's priorities. ^ Office of Public and Intergovernmental Affairs. "Office of Public and Intergovernmental Affairs". Va.gov. Retrieved 2014-08-01. ^ Opening Doors | United States Interagency Council on Homelessness (USICH). Usich.gov (2010-06-22). Retrieved on 2013-07-23. ^ "VA Announces New Acting Secretary, Retirement of Deputy Secretary". www.va.gov. 30 May 2018. Retrieved 2018-08-06. ^ "VA chief of staff steps down". stripes.com. 2017-02-24. Retrieved 2017-11-27. ^ "Benefits: Links - U.S. Department of Veterans Affairs". Va.gov. 9 March 2009. Archived from the original on 12 September 2014. Retrieved 1 August 2014. ^ US Department of Veterans Affairs (2016-12-29). "Priority Groups Page". Va.gov. Retrieved 2016-12-29. ^ US Department of Veterans Affairs (2014-07-23). "Health Benefits Home". Va.gov. Retrieved 2014-08-01. ^ Dennis Camire, "New fees, limits face ailing veterans," Albany Times Union, 10 February 2003, A1. ^ Cheryl L. Reed, "VA chief orders inspector to probe disability rating system," Chicago Sun-Times, 11 December 2004, A3. ^ Cory Reiss, "VA fighting losing battle against backlog of veterans’ claims", Sarasota Herald-Tribune, 27 May 2005, A7. ^ "Caring for US Veterans". Costs of War. Brown University. Retrieved 19 July 2011. ^ Feller, Ben (2008-06-30). "President Bush Signs GI Bill - ABC News". Abcnews.go.com. Retrieved 2014-08-01. ^ Military.com (n.d.). "Post-911 GI Bill Transferability Fact Sheet". U.S. Department of Veterans Affairs. Retrieved 2014-08-01. ^ "Veterans Memorial Cemetery | Department of Military and Veterans Affairs". www.colorado.gov. Retrieved 2016-08-31. ^ "AFGE | VA Employees Hold Rallies Across the Country". www.afge.org. Retrieved 2017-06-13. ^ "AFGE National VA Council » fighting for the jobs & future of federal employees". afgenvac.org. Retrieved 2017-06-13. In 1998, the Institute of Medicine began a series of studies to respond to requests from the U.S. Department of Veterans Affairs and Congress for an examination of the health effects of potentially harmful agents to which Gulf War veterans might have been exposed. Wikimedia Commons has media related to United States Department of Veterans Affairs.